DID you ever hear of a guy called Jimmy Jason? A big shot now, a G-Man working for Uncle Sam, but I can remember when I was stringing along with him on a sixth floor office on the corner of Broadway and East Eleventh. "Jimmy Jason, Private Investigations," was on the door. Jason was a wow. He was tall and big and good-looking. Dames used to fall for him. But he was stand-off. One night him and me is sittin' in the office doin' some heavy thinkin'. All of a sudden the outer door opens and in comes some dame. Gee was she lovely? I have seen some good-lookers in my time but that dame had what it takes. She was tall an' she was slim. She had black hair an' big turquoise eyes, and her skin was so fine it looked like it was transparent. She don't waste no time. She opens up her handbag an' she takes out a packet of dough. She puts it on the corner of the desk. Then she starts talkin'. She speaks as good as she looks and her voice is low and husky. Every now and then she stops and coughs. It looks to me like this dame is sick. "Mr Jason" she savs, "I've heard about you. They tell me that you are a man who is not afraid to take a chance, and that you are one of the cleverest private operators in New York. There are ten thousand dollars. Tell me, can you get a man out of prison for that?" "That depends on the prison, lady," he says. She tells him the name of the pen and Jason looks at me. It just happened to be one of them dumps where money talks plenty. Then she comes across with the story. It looks like that she is in love with Tony Fremer. Now everybody knows that Tony was sent up a year before on a ten years' rustication for usin' a gun on Willie Lacazzi. It is also a cinch by the way this dame is talking that she is well stuck on Fremer, and she wants to get him out. When she's finished spielin', Jason says, "I think it might be done. Anyhow, we can try." "I'm glad you can help, Mr. Jason," she says, "there's only one thing, but it's rather important. You've got to get Tony out before September." "You ain't giving me much time, lady," he says. "We're in the middle of July now." "I'm sorry," she says, "but he's got to be out by September, and if he is there'll be another ten thousand dollars for you." "O.K., lady," he says. "You can consider him sprung. Just leave your address with Riscoe, will you? I'll contact you later." She gives me her address, she says good-night, an' she goes out. "Well, what do you know about that, Willie?" says Jason. "It looks good to me," I say. "I reckon it'll cost us about five thousand to spring that guy out of that dump and we ought to be on fifteen thousand profit. Nice work, Jimmy." "Yeah?" he says. "Well, there's something screwy about it. Listen to this. Did you see that woman's shoes? You didn't, you never see a thing. Well, one of them wanted mending, an' her clothes were good but they were darned old. What's a woman in that state doing with ten grand?" He picks up the bills off the table. They are one-hundred-dollar bills and they are new. "Listen, sourpuss," he says. "Get around first thing in the morning. Check up on these bills, find out the bank they came from and find out whose account paid 'em. "When you've done that, do a little checking up on Tony Fremer. I want his record, an' let me know where the contact is between him and this dame." NEXT morning I rustle around, and at 12 o'clock I have got the dope like he said. The woman is a dame named Cynthia Fernand, but I can't find out very much about her before she contacted with Tony, which was eighteen months before. She fell for this guy Fremer with a bump, and it looked like she was helping him in a dope-peddling racket that he was running at the time. Fremer was a bad guy. What a woman who looked as nice as she did was doing stringing along with a slug like him I don't know. Dames do funny things anyway, or ain't you heard about that? Now about the dough. It looked like that was fairly normal. I traced the money to the Sixth National Bank of Illinois New York branch. She cashed a cheque there for it, and the cheque had been made out by Fritz Schreit, who was one of the hottest shyster lawyers in the city. 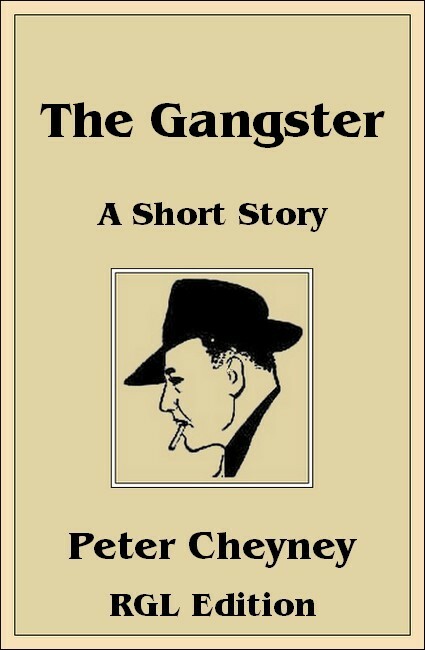 He was a gangsters' mouthpiece, and he was good at his business. It looked like sense to me that Fremer had pulled the usual stunt of turning over his dough to Schreit when he was sent up and it looked like Schreit had done the normal thing and handed ten grand to the woman to contact Jason in order to get Fremer out. I tell Jason all this. "Relax, Sherlock," he says. "You'd have thought that as Fremer an' this dame was so stuck on each other, he'd have fixed that Schreit would let her have money for shoe repairs while he was in gaol, wouldn't you? It's funny that this dame should go to Schreit to get the money and walk out with ten grand and bring it round here to us when she looks as if she could do with a man's size steak." I don't see what all that matters, and I tell him so. "O.K., Willie," he says. "Now you get busy. You take a little trip up the river. Take a coupla grand of the money and just get around with some of the guards of that prison. See if you can arrange a nice little escape, and see if you can fix it quick." WELL, I fix it. I get three prison guards in on our side, an' the whole thing is hunky dory. These boys think a nice little escape can be arranged, and I fix it shall come off the first week in August. So we just stick around and wait. Well, it just don't happen. Fremer is pinched at the last minute by a coupla guards who are not playin' with our team. I tell Jason this an' I reckon that he will be burned up considerable, but he just says that he reckons that this dame Cynthia Fernand has got tubercular an' I am to go and get a line on whether she is havin' medical treatment any place for it. Can you beat that? Will you tell me what this dame havin', consumption has got to do with our escape plot goin' haywire? All right. I find out that this dame is havin' treatment at St. Mary's, and when I tell Jimmy he goes around there, and when he comes back he says that the doctor says that he reckons that this Cynthia Fernand can last about a coupla months. She is as bad as that. He also says that if she could go to some sanatorium in Switzerland she might have a good chance. "I'm seeing daylight," I tell him. "The idea is to get Fremer sprung out of the pen so that they can take a run-out powder to Switzerland together." He don't say nothin'. He just looks at me. "Now listen, Brilliance," he says after a bit. "We're goin' to have another go to spring this guy, but this time we ain't goin' to work the same way. I see that Red Schultz is in that pen, too, an' I have been talkin' to some pals of his an' they want him sprung, an' I have told 'em that I will look over the job. "You gotta fix a watertight scheme to get this Fremer out within a coupla weeks, an' Red Schultz has got to be sprung, too. Then everybody is goin' to think that Schultz's pals have pulled it. But nobody is to say a word to Fremer. Schultz can know, an' when the time comes for the break he can bring Fremer out with him. Now go an' get busy." Well, this time we fix it. SIX nights later, Jimmy an' me are sittin' in a roadhouse like we have planned an' I get a tinkle there from one of the prison guards' wives who is on the job that Schultz an' Fremer are out an' that it will be about half an hour before the escape is known. McGonnigle—another one of Jimmy's boys—is pickin' up Fremer in a car at an arranged spot, an' Schultz's pals are meetin' him with a car at another place. Jimmy is drinkin' a highball at the bar, an' I go over an' tell him that everything is O.K. We go outside an' we get in the car an' we drive off. IT is two o'clock in the mornin' when we pull up at Schrelt's house. Jimmy rings the bell an' after a bit Schreit opens up the door. 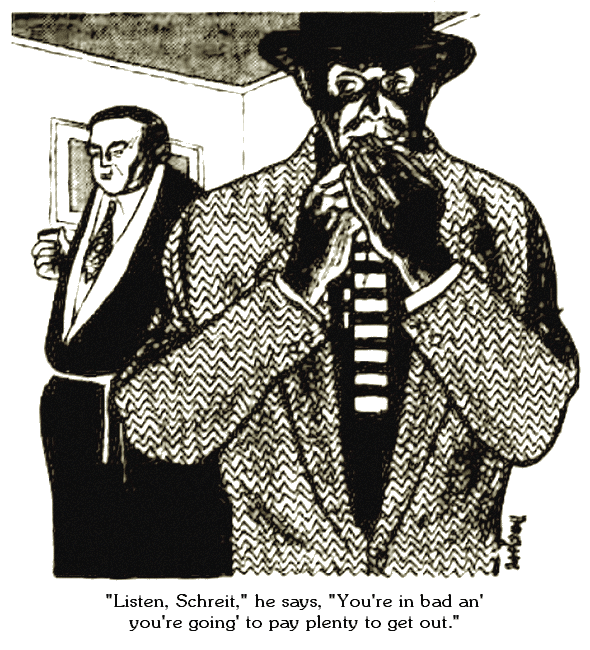 Jimmy steps inside an' Schreit asks him what he wants. Schreit looks at Jimmy like he was goofy, but he takes us into some room an' asks what all this hooey is about. "Listen, Schreit," he says. "You're in bad an' you're goin' to pay plenty to get out. "You knew that this dame Fernand was all set to pass out with tubercular, an' you also knew that there was only one thing she wanted to do before she died, an' that was to kill Fremer because he was the guy who was responsible for all that had happened to her. "So you get her along an' give her ten grand for me to spring Fremer, so that she would bump him off, an' then you would have the dough he turned over to you before he was sent up. An' you also knew that she won't worry you any more because she would get herself pinched for the killin'. "But you oughta have got her shoes mended before she came around to see me, because that made me start thinkin'. "Now Fremer is out, an' if I tell him about your little game what do you think he's goin' to do to you? He's goin' to bump you off, ain't he? "Now, if I get twenty grand I'll look after him. If I don't, then I'm going to bring you boys together. Schreit is scared stiff. He makes a lot of talk, but he pays up. Jimmy puts the dough in his pocket an' we say good-night an' scram. WE drive around to the Madison Arms, where this Cynthia Fernand is staying', an' we go up to her apartment an' knock her up. Is she surprised? Jimmy puts the dough on the table and hands her a packet. "Listen, lady," he says. "There's your steamer tickets and reservations for Switzerland, an' there's twenty grand for expenses. You're leaving' tomorrow." He says goodnight an' we go off, leaving' her with her mouth open. We drive round to the office an' Jimmy pours two stiff ones out of a flask, an' then he hands me five hundred-dollar bills. "That's for you, Face-ache," he says, "an' I don't think you was worth it." "Say, listen, Jimmy," I say. "What is this? What's the setup. Where's Fremer, an' what do you get outa this?" "I knew that Fremer would fix so that he wouldn't escape the first time because he knew the dame was all set to get him," he said. "But that suited me. "When that broke I went to the Commissioner an' told him that I'd got information that there would be more attempts to break out; that the guards was all fixed, but that I could handle the job for five grand. "It worked. McGonnigle and me was sworn in as special deputies to bust the plot—an' we bust it. The Schultz mob was pinched by some other guys, an' when McGonnigle met Fremer he shot him for resisting' arrest—like I told him to." He puts his hat over one eye. "Listen, Unconscious," he says. "You gotta look after the office for a bit. I'm takin a vacation." "Where you goin', Jimmy?" I say. "The coast?"